The venue for the event is the 21st Century Forest Park in Nago. It’s a crafts market, but it is also a fair filled with foods and sweets stalls, and the combination draws larges crowns from across Okinawa. It’s the 10th Manmaru Fair, a gathering twice each year, bringing together more than 170 craft shops of both professionals and non-professionals. With accessories, leather goods, pottery, traditional craft work, aroma products, and succulent plants…it is difficult to say everything available, because there are so many genres of shops. And that, say the organizers, is why it is a unique kind of exhibition, open to visitors for free. 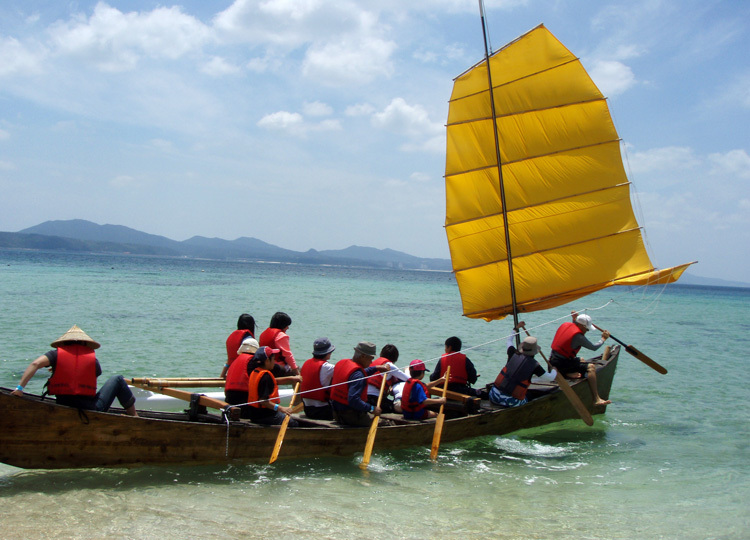 The Manmaru Fair offers a unique chance to sail on a sabani. The 10th Manmaru Fair takes place Monday, a Japanese holiday, at 21st Century Forest Park in Nago City. The fair runs 10 a.m. ~ 4 p.m. 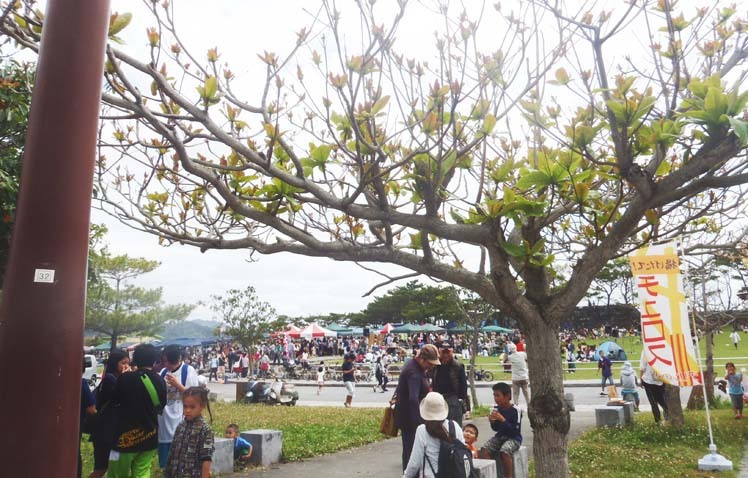 Early arrivals can park at Century Forest Park, but once the parking lot is full, visitors must use the Nago Fishing Port. A variety of food stalls and trucks will come together and attract people to specialties. Visitors can count on making food courts around the area. Throughout the afternoon, various workshops such as a Sabani riding experience, which is a little fishing boat in Okinawan dialogue, and a chair do-it-yourself class by a local popular wood working group ‘Higë’, are popular among local people, and only one coin, ¥500. Some classes are very popular, so better visitors should go early if they want to try. ‘NPO One’s Partner Group’ provide information on dog adoption. Okinawa is historically one of the prefectures with the highest rates of having to euthanize stray animals. They hope a lot of people to come and adopt dogs. At the main stage, music and dance performance will be held through Fair, including Okinawa’s traditional opera dance, ‘Kumiodori’ being played in a modern version. Dance classes are planned for a grass area and at the beach. Events begin with Okinawan folk singers Yamashita Group at 10:30 a.m., followed by Wind of Hokuzan, a modern version of Kumiodori, at 11:30 a.m. A Hawaiian Hula Show starts at 1:30 p.m., followed by Yanbarise at 3 p.m.
African dance by Anmina takes place from noon to 3 p.m. at the grassy area, as will a Hawaiian Hula by U’l Ohana at 2 p.m. There’s a 12:30 p.m. belly dance by Yanbaru Belly on the beach.